Baikonur Cosmodrome in Kazakhstan - Universe Galaxies And Stars Section. Cargo Ship Blasts Off from Baikonur Cosmodrome in Kazakhstan. 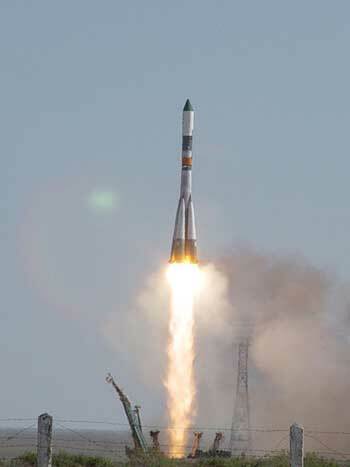 cargo ship blasted off from Kazakhstan. An unmanned cargo ship blasted off from Kazakhstan today, en route to deliver supplies to the International Space Station. Progress 15 lifted off from the Baikonur Cosmodrome at 0503 UTC (1:03 am EDT), and safely reached orbit 10 minutes later. It's carrying propellant, air, water, spare parts, life support components and equipment hardware. One special delivery is a set of new pumps for the US spacesuits on board the station that experienced cooling problems earlier this year. The crew used Russian-built spacesuits to make their latest spacewalks.